Volunteers trying to get Sam Lee out of the ravine. 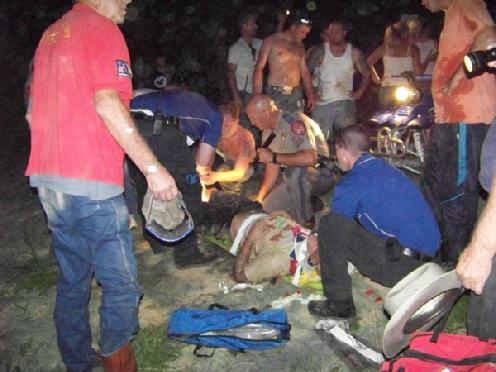 Dramatic Late Night Rescue in 4 Wheeler Accident, LIVINGSTON, August 3, 2008 - A multi agency effort in conjunction with concerned friends and family transpired into a dramatic late night rescue deep in the woods in a terrible 4 wheeler accident. Shortly before midnight on August 2, 2008, Sam Lee, 28 of Livingston was out 4 wheeling with friends deep in the woods off of Highway 146 just about a mile past FM-2610. 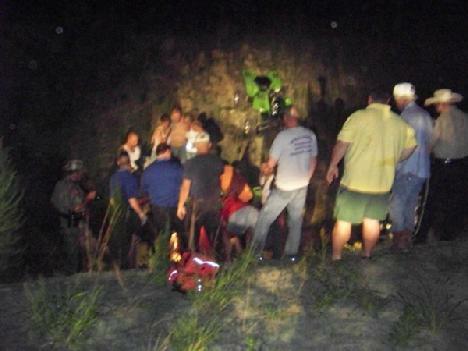 The accident occurred a couple of miles off in the woods near a gas pipeline when Lee crashed in a deep ravine. Lee's brother was able to place a call to the Polk County Sheriff's Office and in a matter of minutes DPS Trooper Kevin Burman arrived. Shortly after that, Polk County Sheriff Deputy Keith Franklin showed up, followed by DPS Trooper Darwon Evans. Soon the South Polk County Volunteer Fire Department arrived. Also assisting was Game Warden Ryan Hall. Once out of the ravine, EMS were able to work on Lee. The entrance to get the ambulance and vehicles to perform a rescue was blocked by a gate that was locked with a pad-lock and chain. The volunteer fire department used a jaws of life type device to cut through the chain in order to get the gate open so vehicles could get through to Sam Lee who was incapacitated in the water in the bottom of the ravine. Troopers Kevin Burman and Darwon Evans along with Game warden Ryan Hall and a surplus of volunteers were able to get Lee out of the ravine and onto the back of a truck and then taken to an Americare Ambulance. Shortly after that, Lee was transported to Highway 146 where a landing zone was set up to Life Flight Lee to Hermann Hospital in Houston. Life Flight lifted off with Lee a 1:13 am enroute to Hermann Hospital.